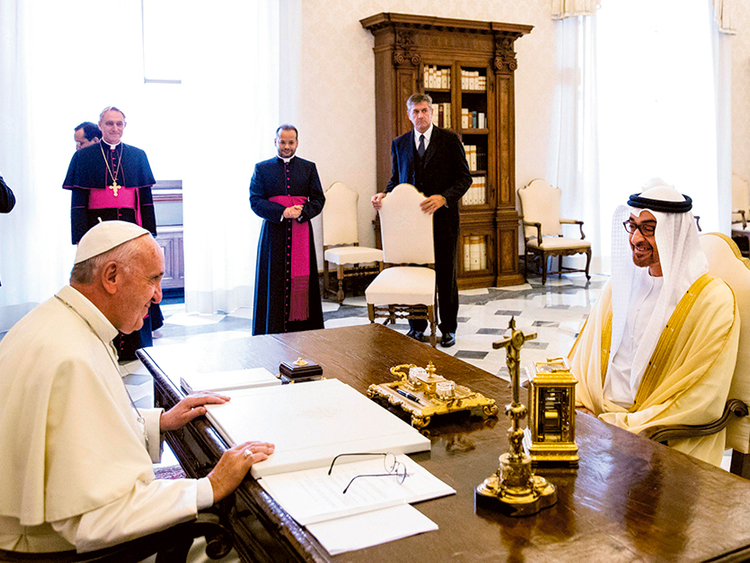 Vatican City: His Highness Shaikh Mohammad bin Zayed Al Nahyan, Crown Prince of Abu Dhabi and Deputy Supreme Commander of the UAE Armed Forces, on Thursday exchanged gifts with Pope Francis, Pope of the Catholic Church. Shaikh Mohammad presented Pope Francis with a photo book of the archaeological findings on Sir Bani Yas Island, an island designated as a natural reserve in in 1977 by the late Shaikh Zayed Bin Sultan Al Nahyan. The book included information on different archaeological discoveries on the island, including the landmark historic church and monastery dating back to the 7th and 8th century AD, demonstrating the clear spirit of religious tolerance and coexistence that prevailed in the region historically. 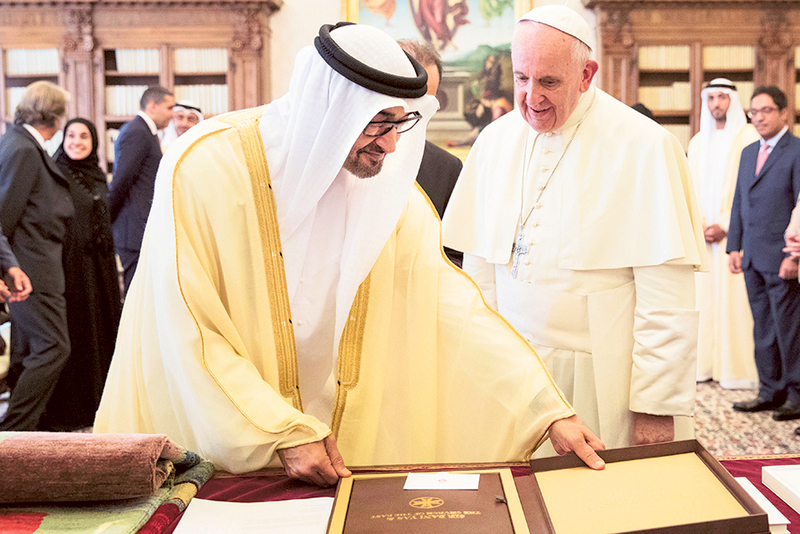 Shaikh Mohammad also presented the Pope with the Carpet of Peace, produced through an initiative launched by Shaikha Fatima Bint Mohammad Bin Zayed. The initiative aims to support women in rural areas of Afghanistan, empowering them with the means to integrate into the workforce within the Afghani culture. Shaikh Mohammad was accompanied by members of his official delegation, including Reem Ebrahim Al Hashemi, Minister of State for International Cooperation, Khaldoon Al Mubarak, Chairman of the Executive Affairs Authority, Dr Hessa Al Otaiba, UAE Non-Resident Ambassador to the Vatican, and other officials. Pope Francis welcomed Shaikh Mohammad’s visit to the Vatican City and highlighted the importance of the visit with its objective of establishing mutual cooperation and exchanging views on issues of mutual concern. 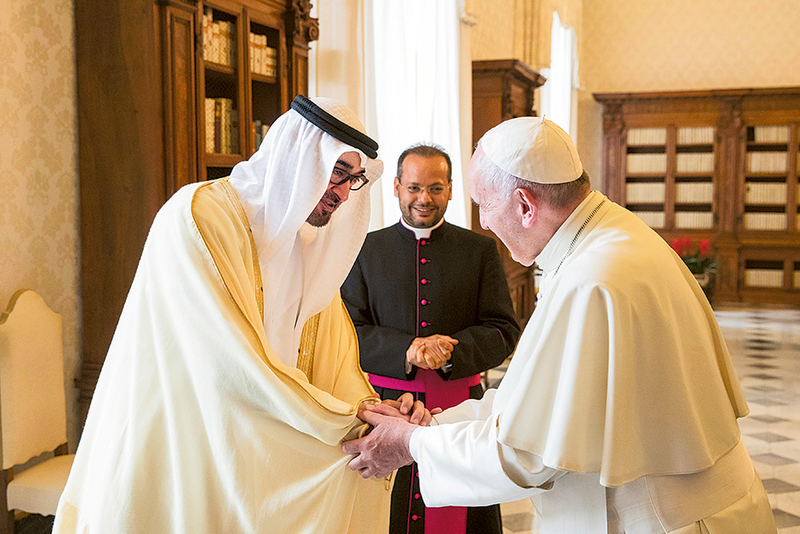 Pope Francis congratulated Shaikh Mohammad and the accompanying delegation on the occasion of Eid Al Adha and conveyed his greetings to President His Highness Shaikh Khalifa Bin Zayed Al Nahyan on the occasion. 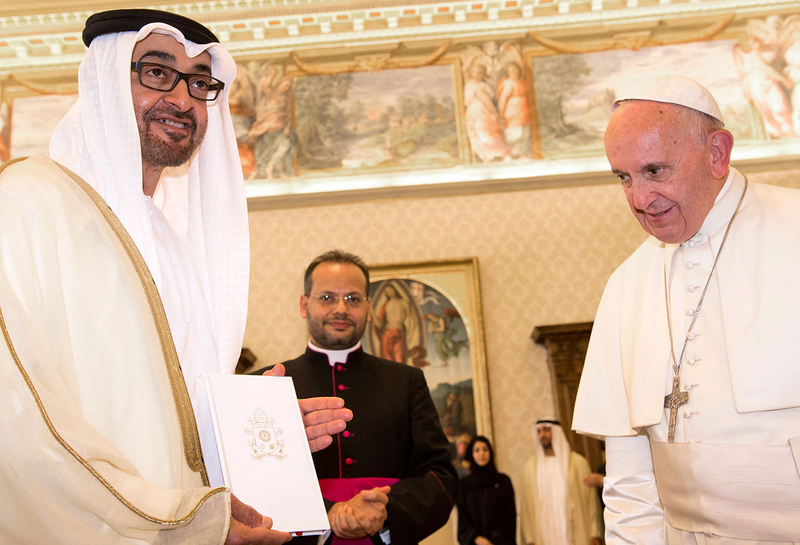 For his part, Shaikh Mohammad expressed great appreciation for the Pope's noble sentiments and generous reception. He conveyed the greetings of Shaikh Khalifa and his appreciation for the Pope's role in working towards peace, love and solidarity between the peoples of the world. 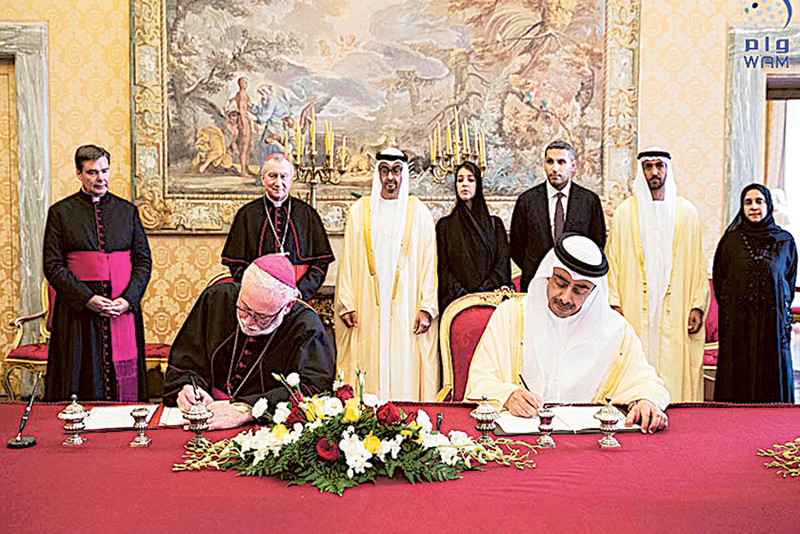 Shaikh Mohammad, who was accompanied by Shaikh Abdullah Bin Zayed Al Nahyan, Minister of Foreign Affairs and International Cooperation, emphasised the importance of strengthening ties and enhancing dialogue between the UAE and the Vatican as fundamental to addressing the challenges the world faces today. He stressed that today, more than ever, there is a need to build bridges of collaboration and dialogue between different cultures and religions, standing in solidarity against those who promote religious strife, sectarianism, racism and intolerance, thereby threatening the security and stability of the world. He expressed great appreciation for the role the Vatican has played in enhancing dialogue between civilisations, its humanitarian efforts and its efforts to enhance inter-religious dialogue. He made particular mention of the most recent dialogue between Al Azhar and the Vatican, which culminated in an announcement to hold a global peace conference and a commitment to working together to combat poverty, extremism and terrorism. He added that such an initiative reinforces the culture of forgiveness, coexistence and confirms that the world stands united against terrorism and extremism. He further emphasised that a dialogue between the world's most prominent religious institutions sends a clear signal of peace to the world. For his part, Pope Francis praised the UAE's efforts to promote tolerance, dialogue and coexistence between different people and cultures of the world. He congratulated the UAE for its ongoing humanitarian and philanthropic initiatives focused on education and healthcare and its role in promoting and supporting sustainable development around the world, through the adoption and deploying of sustainable sources of energy and by supporting countries and communities in need. He expressed confidence that the meeting with Shaikh Mohammad will enhance joint collaboration that will benefit humanity and uphold the values and principles of inter-faith coexistence, tolerance, peace and the empowerment of social and sustainable development.